Gingival gum recession is the pulling of the gums away from the teeth and is most common in those over the age of 40, but can begin as early as the teenage years. There are many reasons you could suffer from gingival gum recession without gum disease. Some of these reasons can easily be fixed through simple lifestyle changes and could reduce your chance of either continual gum recession, or eliminate it all together. 1. Genetics - 30% of people suffering from gingival gum recession inherit it from a genetic trait. Even if genetics is linked to a gum recession issue, it can be corrected through surgery and special care to the gums. 2. Aggressive tooth brushing - This alone can cause a lot of pain, swelling, and bleeding in the gums. Talk with us about the appropriate texture of toothbrush you should be using and the proper technique of brushing your teeth. Sometimes the gums can recover on their own, but a consultation with us should be done in order to rule out further damage to the gums from excessive or aggressive tooth brushing. 3. Improper Dental Care - Brushing regularly, flossing, and use of mouthwash are all basic steps to ensure proper dental care, but a healthy diet and exercise should be considered as well. We can further assist you in how to improve your overall dental care with diet alone. 4. Hormonal Changes - During different times in the lifecycle, hormones begin to change. This can be caused by pregnancy or mid-life hormonal dips in the endocrine system. Talk with us and your primary doctor for further testing if this may be a concern for you. A simple supplement may help to eliminate your issues with gum recession. 5. Piercings - Sometimes various facial piercings can cause internal damage to the gums. Strategic planning before getting a piercing is important and it may be required to remove the piercing later on to prevent deeper damage to the gums. 6. Tobacco use - Tobacco is commonly known to cause oral issues, namely gingival gum recession. Whether it's loose tobacco or cigarettes, tobacco use is proven to be very damaging and can cause long term effects on overall health. Consider ceasing the use of tobacco by starting a program through your doctor, or teaming up with some friends to stop using tobacco. These small steps can reduce not only further issues with dental health, but can reduce long or short term health problems later on. 7. Teeth Grinding- If you're not sure if you grind your teeth or not, have your teeth examined by your dentist. He/She can usually confirm right away if this is in fact your problem and is what is causing gingival gum recession. You may need a fitted mouth guard or further correction to avoid this problem and help protect your teeth. Prevention of gingival gum recession can be done with good dental hygiene practices, proper diet, and avoidance of tobacco products. Ask us for tips on good brushing techniques, nutrition assistance, or smoking/tobacco programs to help you quit. Stopping recession from continuing can be solved by different types of oral therapy including the realignment of teeth into their proper position and grafting of gum tissue, each of which can stop the procession of gum recession. Please call us now at 480-376-2848 opt. 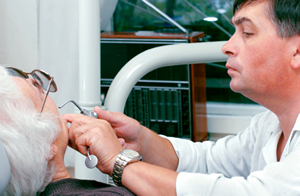 1 and make your appointment for a full and proper examination of your overall oral health. Don't wait until problems arise and it's too late. Proper oral health is imperative to maintain general health and prevent long term diseases from setting in.